As Cuba emerges from isolation, poised for transformative changes, a recently discovered late-1950s Rolex Submariner is a talisman from the country's turbulent past. The watch had been smuggled out of the country in the wake of the Cuban Revolution in 1959, when its owner escaped to Europe. 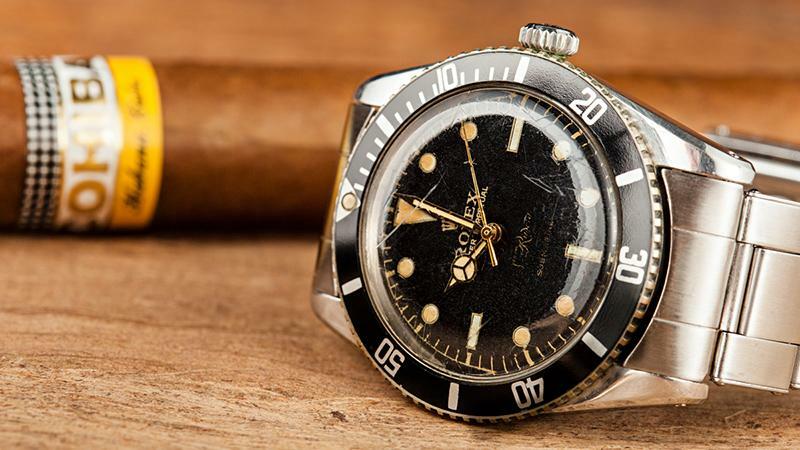 It remained in the family until last year when Paul Altieri, founder and CEO of Bob's Watches, a leading online specialty retailer of pre-owned and vintage Rolex timepieces, purchased it for his extensive private collection. The Submariner's dial is marked with the name Joyería Riviera, Havana's answer to Tiffany & Co. and the first Cuban jeweler to be named an authorized Rolex dealer. "For whatever reason, they convinced Rolex to put the name of their store on the dial, which makes it very rare," says Altieri. "Based on our research, we have not found another Submariner with a dual-branded Joyería Riviera dial." Altieri estimates the watch would fetch between $50,000 and $70,000 if it were to go on the auction block. But at the moment, he has no plans to sell. "I probably will keep it forever," he says. "Not only is it a good investment, but I don't think I can ever replace it, and I enjoy having it and wearing it." Among Altieri's other treasures is a Rolex Daytona "Paul Newman" 6263, valued at about $300,000. Since acquiring Bob's Watches in 2010 and revamping it as a Rolex specialty site, Altieri has amassed a personal collection of hundreds of vintage Rolexes. Some of the rare Rolex finds available at Bob's Watches are a 1987 18K gold, manual-winding Daytona Ref. 6265 ($82,499) with the original box and papers, an 18K gold Submariner 1680 with an unusual purple dial ($29,999), and a Daytona Anniversary model in platinum with an ice blue dial ($50,000). While all vintage watches have stories to tell, very few have made their way out of Cuba under Castro, who apparently was quite a Rolex fan himself as evidenced by a number of photographs of him wearing one. "It's hypocritical on his part that he took over that country with hopes of egalitarian reform, but yet he wore a Rolex watch on his wrist," says Altieri, who finds vintage watches particularly interesting because of their unique characteristics and the stories about the people who owned them. "This particular Submariner," he adds, "has a very unusual story with a very unusual retailer from a very unusual time period in Cuban history."